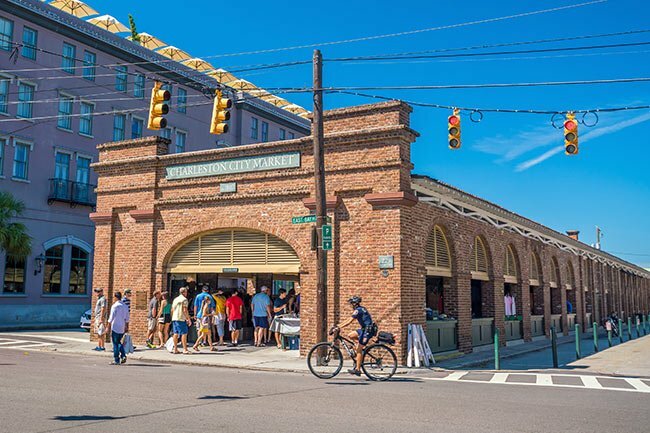 Occupying a place of prominence in Charleston‘s historic district, the market is considered a quintessential experience for tourists visiting the Holy City. While many people incorrectly refer to the market as the “slave market,” no slaves were ever sold here. Instead, they were sold on nearby wharves and in other local markets such as the Old Slave Mart on Chalmers Street. The market takes up four city blocks and houses six distinct structures, three of which are adjoined. 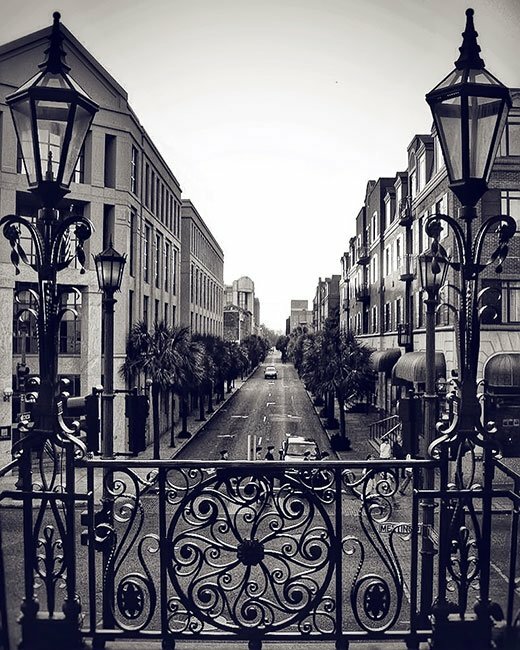 As a complex, its perimeter is bound by Meeting Street, East Bay, South Market Street, and North Market Street. These buildings in turn are intersected by Church Street, Anson Street, and State Street – all three of which run parallel to Meeting and East Bay. 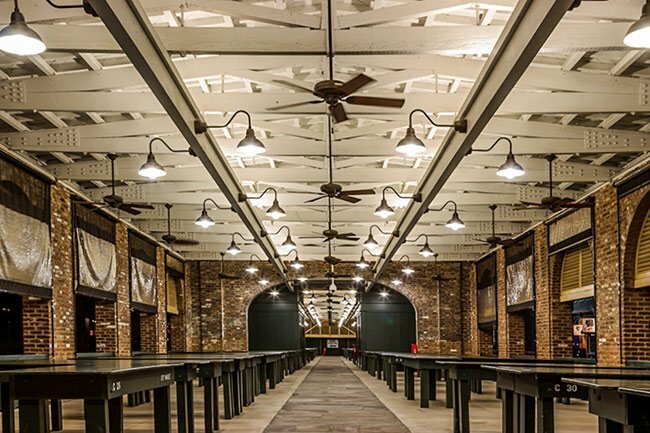 Today, the market complex consists of three large open-air sheds, two enclosed and connected sheds with shops, and the two-story Market Hall, detailed in the next section below. 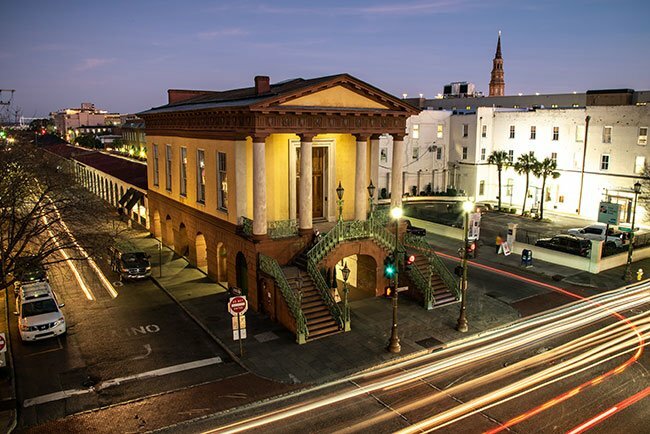 Market Hall is a Greek Revival building designed by noted Charleston architect E.B. White in 1841. 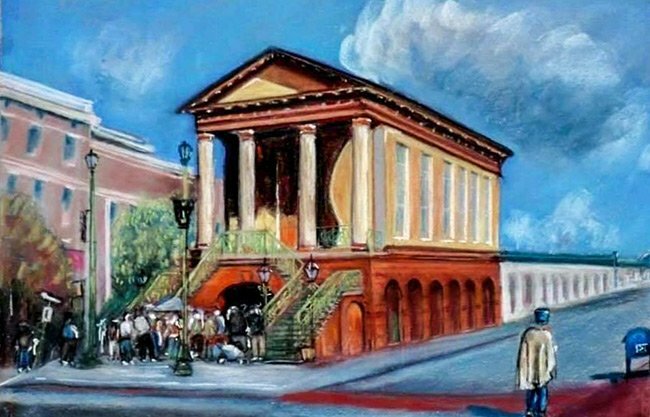 Market Hall has been the headquarters of the Charleston chapter of the United Daughters of the Confederacy since 1899. It serves as the Confederate Museum. Images of bull and sheep skulls in the Market Hall frieze advertised that meat was one of the primary product’s sold in the outdoor sheds. Because unsold meat had to be discarded at the end of the day, and butchers also had to dispose of scraps, vultures populated the market area and kept the streets clean of rancid meat. Residents gave the scavengers the nickname of “Charleston Eagles” because of their invaluable benefit, and they were awarded protection by law. 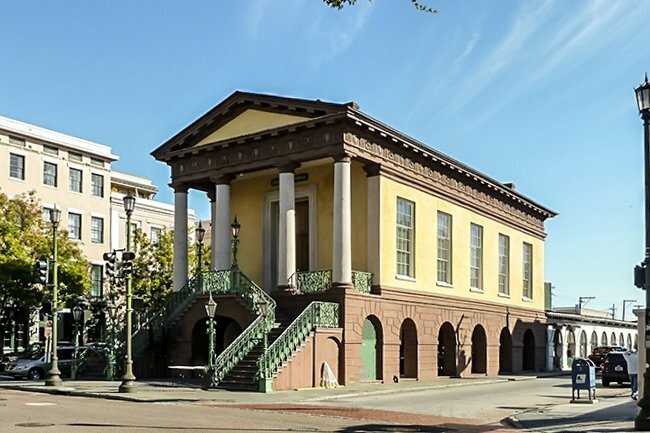 In recent decades, likely from misinformation from tour guides, some locals and visitors alike have referred to this as Charleston’s slave market, but that is incorrect. 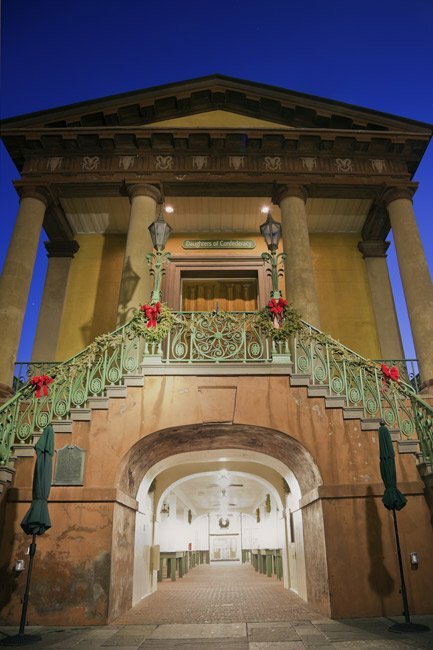 The sale of slaves did occur in Charleston but it never occurred at this location. The closest extant example of a slave mart is located along Chalmers Street and is now the Old Slave Mart Museum. 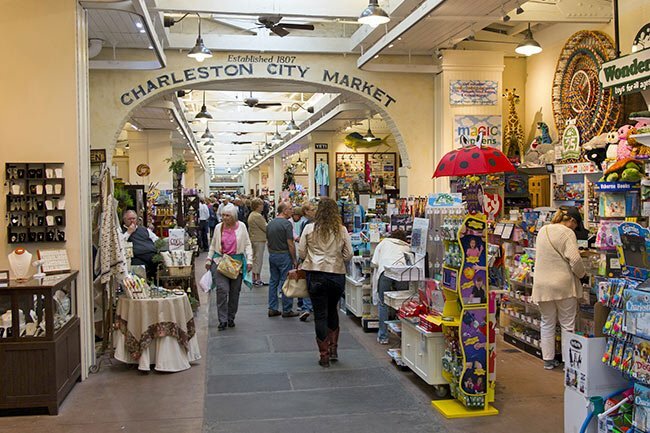 The market is a mecca for anyone seeking Charleston souvenirs and, as such, offers an abundance of common kitch like magnets, mugs, and postcards. In addition, one can also find the sort of handcrafted goods – jewelry, leather wallets, and woodwork – standard to flea and farmer markets across America. More unusual are products unique to Charleston or at least to The South at large. These include delectables like saltwater taffy and benne seed wafers, as well as fine Charleston art and palmetto roses (made from the supple new fronds of palmetto trees). 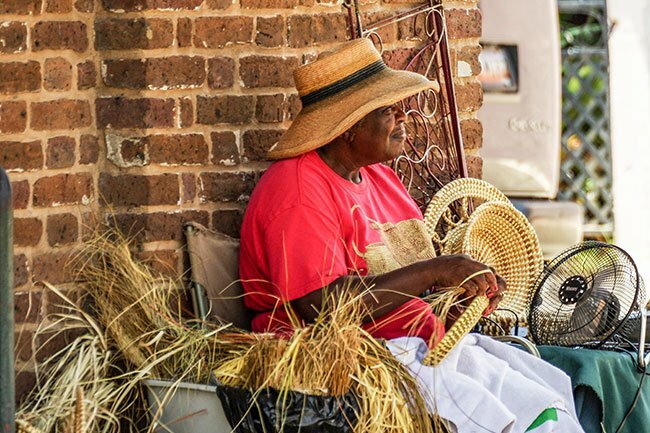 Most famous of all are the market’s “basket ladies,” women (and men) who sell traditional Gullah sweetgrass baskets. 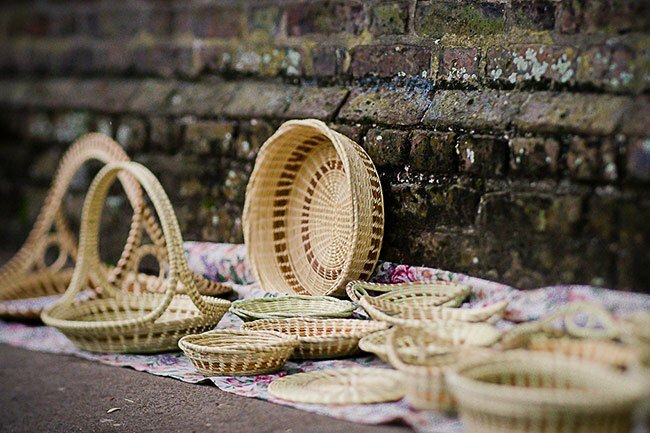 Sweetgrass baskets are almost identical in style to the shukublay baskets of Sierra Leone, where learning to coil baskets “so tightly they could hold water” was an important rite of passage in West African tribes like the Mende and the Temne. 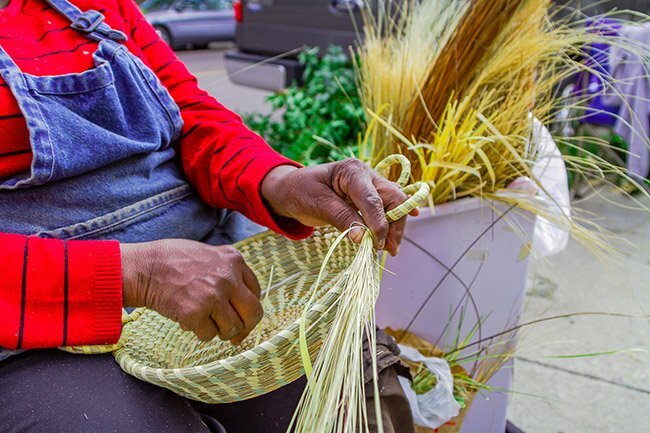 This basket-making tradition came to South Carolina in the 17th century by way of West African slaves who were brought to America to work on plantations. West Africa resembles South Carolina in both climate and landscape, and rice had long been cultivated there. In slaves, plantation owners gained not only free labor but also a wealth of knowledge and skill. Though controversial, carriage rides remain a popular part of the tourism industry in Charleston. Traditionally pulled by horses or mules, the large wooden carriages are a constant presence along the border of the Market, especially between Church and Anson streets, where barns are located. 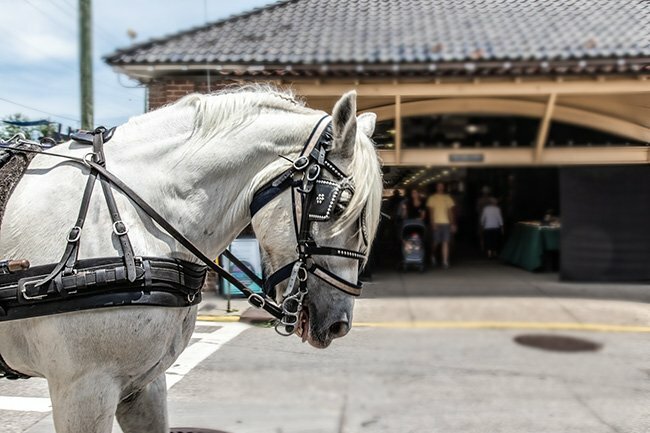 After departing from the Market, carriage drivers slowly weave their way through Charleston’s historic neighborhoods, dispensing historical nuggets to passengers along the way. The carriage companies have come under fire for a variety of reasons, but primarily because of questionable animal welfare policies. Legal and citizen advocacy groups have formed to help protect the animals, who are often required to pull upwards of 6,000 pounds in extreme Southern heat. Other cities have reduced both weight and temperature limits in an effort to ensure humane conditions, but Charleston has lagged behind. For decades, residents have been also frustrated by delays in traffic caused by the horses’ slow pace. Additionally, although the horses are required to wear slings, excrement can regularly be found on the streets of the city. 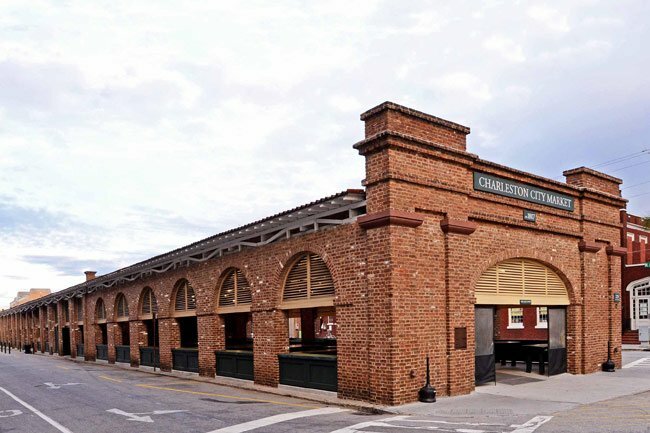 (The Market) The Market Hall is considered one of Charleston’s best examples of the Greek Revival style. The Market Hall is of Roman Temple form with one high story over a rusticated lower open arcade. Building materials are stucco on brick with sandstone trim. The tetrastyle Roman Doric columns of the portico help support the elaborate entablature and pediment. Bucrania and ram’s heads are located in the metopes. Cast iron rails are located on the double flight of steps that lead to the main floor of the building. Although small, the Hall is imposing as it stands above and at the head of a long arcade of market stalls. The hall was designed by Edward B. White in 1841, who practiced in Charleston from 1842-1879. An amazing visit a few years ago. The market, the food, the beauty of the homes, carriage rides! What else could you want? A place I’d love to see again and one that I’ll not forget!